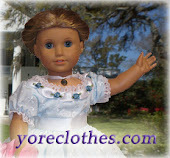 'Doll Clothes of Yore' has finally released the Spring 2013 Collection, and just in time for Easter, too! We've added to our variety of designs 5 new selections! The 'Marguerite de Navarre' Dress! A beautiful and richly colored Tudor dress - added to our also brand-new Tudor section! We hated to see this design go, so our popular 'Off to the Faire' Dress has been remade - this time in a lovely shade of sage green! We've been waiting a long time to make this dress inspired by the first African-American Poetess! The 'Phillis Wheately' Dress is here! This dress was inspired by a costume seen in Mel Gibson's film 'The Patriot'. It's named for the wife of a founding father! Check out the 'Julia Stockton Rush' Dress! This incredibly elegant dress is trimmed with delicate Venise lace! 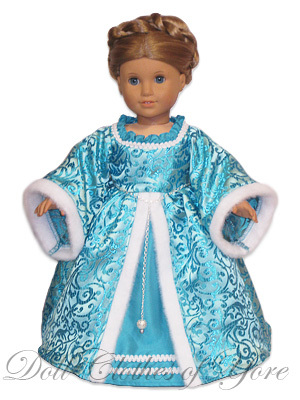 The 'Mary Anna Custis Lee' Dress is the latest Ball Gown edition! I have finally been able to change the structure of yoreclothes.com! Since I introduced some 'Tudor' designs last spring, they have been more popular than I could have imagined! I have wanted to put them into their own section, since technically the 'Renaissance' is separated from 'Tudor' and 'Elizabethan' anyway. So I have added the 'Tudor' section to my website. Some of you may be sad to see this, but I have also removed my 1970's section. I know clothes from the 70's are cute, but frankly I don't like to make them. It has also been hard to keep up with, so for now, I won't be offering 70's clothing. 'Tudor' is much more fun! Hopefully the 'Spring 2013' collection will be coming out soon... I had intended to have them out already, but I've been so busy I haven't been able to sew them. However, I can promise that the new designs will be worth the wait! I am also bringing back my 'Off to the Faire' Dress - only this time not in yellow. I've received some wonderful suggestions by email, and I can't wait until I get the time to act upon them! However, please remember that a design can take months to make it's way from my sketch pad to the website. Keep the suggestions coming! A personal tidbit + March 2013 Dress! Things have been so busy here in SW Virginia! Most of you readers know that I (Emily) run 'Doll Clothes of Yore', but you may not know that I also have another part-time job and I'm currently in my last semester of college. So if you ever wonder why it takes a long time for a dress to come out or for changes to be made... that's why. I wish I could give all my time to new designs, but alas, the current designs have to be remade too! I estimate that in 2012 I made 500 dresses - that's not including hoopskirts, bustles, petticoats, etc! It excites me to be able to release a new design - it allows me to be creative and just have something new! My March 2013 Dress is one that I have been working on for the past several months, and it's finally done! I'm very pleased with how it looks, and I hope you are too! It has fur trimming and a 'pomander', both of which are new to my designs! It is my goal to release my Spring 2013 collection before Easter - I had wanted it to be out sometime the first week in March, but I haven't been able to finish the designs. Also in March, I will be re-working the time periods, or 'Eras' that I offer in my clothing. Instead of offering 1970's, I will be splitting my 'Renaissance' section into 'Renaissance' and 'Tudor'. Besides being more historically accurate, my Tudor designs have become more popular than I expected - so they deserve their own section! If you have any ideas for future designs, email them to me! I love to hear your comments and ideas. My email address is yoreclothes@ntelos.net.